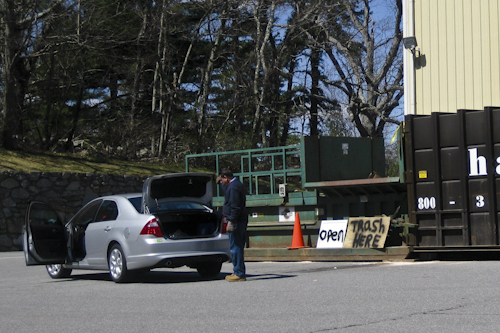 The refuse hopper at the Transfer Station is closed today for scheduled maintenance, and will likely be closed tomorrow as well. 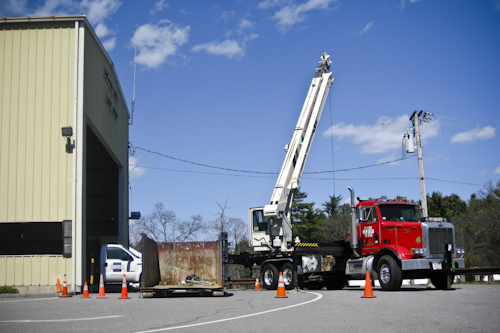 Department of Public Works Superintendent Karen Galligan said the maintenance work is part of a complete rehab that was approved by Town Meeting in 2009. A portion of the work was done last week, with the remaining rehab work taking place this week. Galligan said they hope to have the project completed by the end of day on Friday and expect to be fully operational come Saturday. In the meantime, a temporary area for refuse disposal has been set up alongside the shed that houses the hopper. There are open-top containers and a gasoline-powered portable compactor to handle the trash. The recycling area is not impacted by the work and is open as usual. Why could this not be done on the days that the transfer station is not open? This seems a little silly to me. On the DPW’s behalf, they have been working on the project all week including Monday and Tuesday when the transfer station is normally closed. It’s a big project and once started cannot be stoped until completion.